Okay Me Made May-ers, here it is, the lucky last giveaway for the month! If I had to choose (which luckily I don't have to since I can't actually enter!) it would probably be a competition between the By Hand London Elisalex dress (I can't believe I still don't have this pattern yet!) or the Victory Patterns Hazel dress. To sweeten the deal, I'm also going to be giving away a copy of The Afternoon Blouse pattern to the winner! Yay, two patterns, one competition!! So, how do you enter? Simply head on over to Dresses & Me, choose a pattern* and let me know in the comments what it is. The competition is open worldwide, anyone can enter (not just Me Made May-ers) and it closes at 12am Friday 30th May (NZ time). *Prize does not include gift vouchers, sorry. 154 comments on "Me Made May Giveaway #4"
It's a toss up between BHL's Victoria Blazer and Colette's Hawthorn. Thank you! The By Hand London Flora. Although the Elisalex is tempting too! I've love to have BHL's Elisalex dress pattern! The Anna dress from By Hand London! I love the slash neckline and kimono sleeves. Juniper pants or Anna dress, would be my picks - oh there are some wonderful choices!! A very generous giveaway, I would love the Anna dress By Hand London. Thanks for the give away! Since I already have all the Sewaholic patterns (and we live in the same city, so it's easy to purchase her patterns) I think I will request the BHL - Anna patterns. I've been eye-balling it for ages, but haven't pulled out the credit card yet! I'd choose Sewaholic's Renfrew pattern! 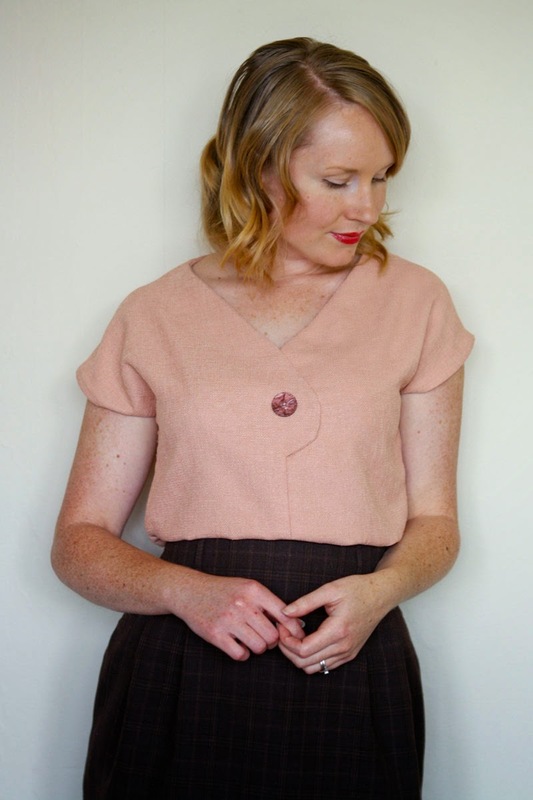 I would love to sew an afternoon blouse... and a Colette Hawthorne or Moneta! Ooh such hard choices... If she had the Gabriola skirt I'd grab that but since it's not there yet I'd go with the Anise. I'd love to try your blouse pattern too! How exciting! Thanks to you and Dresses & Me for the fabulous giveaway! Ooooooh pretty patterns! Hmmm.......Moneta or Anna????? Ummmmmmmm........ Moneta! Thanks, great giveaway! My choice would be the BHL Victoria blazer...I love the sewalong support and really appreciate this level of 'hand holding' as a new(ish) sewer, this would be perfect addition to my handmade wardrobe. It would be Victory Patterns Hazel dress for me I have been eying it for a few (6) months or so, and you blouse is extraordinary cute. But flora it also high up on my list. Oh my gosh Sophie's choice of the pattern world! I'd probably have to go for the Anna though I think! I'm loving hand Made London's Anna dress.how amazing would she be in a pastel linen, tea length, and still a slit?! Definitely the Sewaholic Thurlows. I want to conquer pants before fall! So many nice patterns over there...I would choose Flora dress of By Hand London- it would make a nice addition in my summer wardrobe.. Without any doubt, the Flora Dress from the geniuses from By Hand London. I would love the anouk. Even though it's not my style, I think can alter out to suit my taste. Ooh - I'd go for the Colette duffle coat - Albion. I really fancy making it in a clear pvc as a waterproof summer anorak! I would live to win the BHL Flora or Georgia. And the Afternoon Blouse is top of my list for when exams are finished and I actually have a spare afternoon!! I've currently got my eye on the sewaholic Thurlow trousers pattern. I would definitely love to make my own By Hand London Flora Dress. I love seeing all the versions everyone has been making. What a super generous giveaway from both Dresses & Me and yourself. If I had to choose one pattern it would have to be the Cambie. I love all of the ones I've seen made up. It's so feminine and flattering. OOh exciting giveaway! I'd go for Sewaholic Saltspring and squeeze in a maxi make before summer! Thanks for the giveaway. If I had to choose it would be the Hawthorne dress for sure! Such a lovely pattern!! I think it would have to be the BHL Gorgia for me! I have had the Anna on to to-sew list for a while (Yes, I know I am always late with treads!). Elisalex is also pretty rad! Thanks again for a lovely giveaway - I reckon the Sewaholic thurlows or victory madeline.... Fingers crossed as I'd love your pattern when spring hits later in the year! Tough choice! I think I'd go for negroni to make a shirt for the man. copy of your blouse would be a great bonus. Without a doubt I would have to choose the By Hand London Flora dress. I love everything about it! Thanks for hosting the giveaway. Wow thanks for the giveaway, I'd choose the peony, I've wanted it for a while. And I'd love to try your blouse too. Oh my gosh, what a tough choice! I think I'd pick BHL's Flora, but Moneta is a close second. I've been eyeing the Anouk from Victory Patterns!..i've also be stanning for the Afternoon blouse so that would be great! Wow- great giveaway id love to win the By Hand London Georgia dress. there patterns are all amazing!! I'd love the sewaholic cambie pattern. What a great giveaway! I definitely need the BHL Anna dress in my collection STAT. :) Thanks for the chance to win! That's a tricky choice. I have been hankering after the cambie and tiramisu frocks and the blouse. I love a great bib button! Awesome give away. I would love to give the Anouk a try. I also still need the Elisalex dress too! And you get your nice top at the same time would be awesome! Ooh I'd love to win your afternoon blouse. What a great giveaway. I'd go for the Flora by BHL. It will complete the set that I've got at home. BHL's Flora dress would be my choice. I've seen many beautiful dresses and skirts from that pattern. Thank you and Dresses & Me for such a generous giveaway! Colette's Mabel skirt, please, although it's a difficult decision. And I am dying to make the Afternoon blouse too! Thanks for the opportunity! Hi. Collette peony as I am just venturing into sewing fitted clothes, as opposed to dolls outfits, and this one looks gorgeous. I would choose the Zinnia skirt, I have seen a few lovely versions in the Flickr group. Although I quite fancy an Elisalex! Thank you for a fabulous giveaway! What a cool giveaway! I would love to win the Bonny Knit Sailor top! Hi, Jen! I am popping over from Zo's. This is my first me-made-May and I am really enjoying it. If I had my choice from Dresses and Me it would be the Madeleine skirt. It is so full and cute and I have a secret affection for suspenders! But, I don't know...that Cambie dress is pretty enticing, too. Ah, I love a skirt/dress with pockets! Tough decision, but I'd have to say that it would either be the Colette Moneta dress or the Sewaholic Saltspring dress, perfect for summer sewing! So many great patterns, but I think I would have to choose the Hazel pattern by Victory since it is on my pattern wishlist. I've been wanting to make a Sewaholic Cambie for a while now so that would be my choice. And your Afternoon Blouse is definitely on my to-sew list too so that would be an added bonus! Thanks for the giveaway! Fabulous give away, I'd love to try the Cambie dress. What an awesome giveaway! The Afternoon Blouse is adorable. I have had the Cambie dress by Sewaholic on my wish list for quite a while now, so I would go with that. Ooh, I think I would have to finally get the Victory Madeleine pattern - it's been on my wishlist forever! Gosh, what a nice giveaway! I'd love the Renfrew knit top pattern - can't believe I haven't yet made this. How lovely! And I have had my eye on the afternoon blouse anyway, but to throw in another choice as well is fab! I think I'd go for colette's monetta...I'm a knit freak ! what a great giveaway! I'd go for the Hazel, it's different! Thank you for such a great giveaway! I'm awfully tempted by BHL's Flora, but I think it would have to be Colette's Monetta! I would choose BHL's Flora dress! I think I would chose Victory patterns Simone dress, lovely line and would make a great tank too. Thankyou! Thanks for such a generous giveaway. I love the Victory Patterns Roxanne top. Would be great for work. What a great giveaway! I would have to go with the Minoru Jacket by Sewaholic. It would be prefect for fall (is it bad that I'm already thinking that far in advance?). 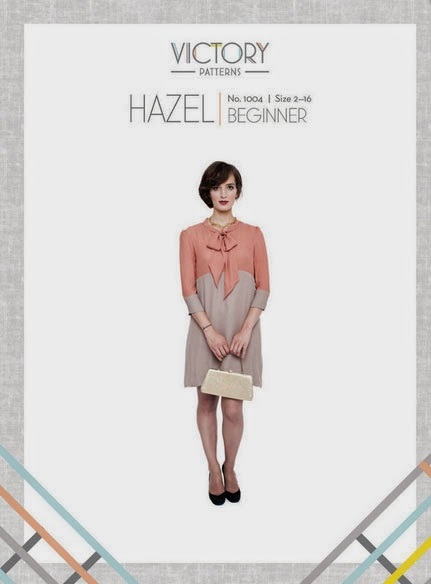 Hi I would like the hazel dress from victory patterns. I have already got your afternoon blouse, so if I win let someone else have that. Love your blog by the way. I definitely need more top patterns in my life. I would love to get my hands on the pendrell. I would love the Afternoon blouse; have had my eye on it since it came out. Other than that I would choose the colette Laurel pattern, as it seems to be so versatile. Superb giveaway. I'd love the Colette Juniper trousers. I haven't made trousers yet and these would be just my style. I would love the By Hand London Flora dress! Thanks for a fab giveaway! I would love to have BHL's Elisalex! I would love the By Hand London Anna Dress or the Sewaholic Cambie! I'd definitely go for the Minoru Jacket by Sewaholic; it's hard to find a good jacket pattern and I already have the fabric! So many choices! I would love to make the Cambie dress. Omg that is a hard choice. I'm tossing up between the flora and the Lonsdale. I think I'd probably go the flora! Renfrew top for sure! Thanks for such a great giveaway!! Thanks! Hard to choose....Madeleine has been on my radar awhile, also might need lady grey and a cambie:) the afternoon blouse looks lovely too! Victoria blazer I think. But it really is a tough choice. Looking to fill two gaps in my wardrobe. I would love Sewaholic's minoru jacket (and your afternoon blouse of course). Great giveaway. Thanks! I love Colette patterns and haven't got around to the Moneta yet. I'm in a 'knits' phase at the moment and this would be a great wardrobe staple. For me the Lonsdale, but there are so many nice ones! Thanks Jen for a lovely giveaway. I would love a copy of your blouse pattern and the colette rooiboos pattern. I would choose the Cambi Dress by Sewaholic. I really like that dress and I want to try my hand at the sweetheart neckline. What a fun giveaway! The Flora dress pattern from By Hand London appears striking, flattering, and a bit different from all the RTW spring dresses! Oooh, I also don't have the Elisalex yet. That one would be awesome. Thanks! By Hand London's Anna dress. I've been coveting it for a while! A close second would be the Victory Patterns' Madeline. Oh, definitely the Elisalex dress! I've been admiring it for a while now, and I'd have to loveliest violet fabric for it. Tough choices, but I think I'd wear the BHL Anna dress the most. So lovely! Thanks for the giveaway! SO hard to decide! It's between Colette's Moneta, Hawthorn, and Victory Patterns' Madeleine. I hope I win, because I really want to try out your Afternoon blouse!!! I would pick the Hawthorn dress. Love it!! I'm still a beginner, so I'm still in need of some of the more basic patterns! Most of my fave sewng blogs seem to favor the renfrew, and I really want to get better at sewing knits! So The renfrew it is! I'm on the lookout for great basics so I would want to win Sewaholic's Hollyburn skirt. Simple Sew's Peter Pan top and the Afternoon blouse. I need more tops !! Madeleine by Victory Patterns for me! I'd really love to give the Afternoon blouse a try! I'd love a go at Collette's Rooibos dress too! Wow that's a difficult one... I'm torn between the By Hand London Flora dress, and the Sewaholic Cambie... Two patterns I've been eyeing for a looooong time! But, as I can pick up Cambie at a local shop, I'll go for the Flora! The Tiramisu Dress, as I have got the perfect fabric for it already. I would love to try out either the collette hawthorn dress or the BHL flora dress, and if course your lovely blouse! Thanks so much. I have had my eye on the Minoru and I think your Afternoon blouse would go well with my full skirts! Thanks for the giveaway! Thank you for the giveway. I'd love the Georgia dress. Hi. Thank you for this chance to check out the collection. I am a total lover of racerbacks and would love the Simone pattern from Victory patterns. I'd choose Anna from By Hand London. I love long dresses. I really enjoy these giveaways, thanks for that, they're great. I have my eye on the By Hand London Anna dress and I would also love to try my hand on your blouse. Love all the Colette patterns! I love the Flora dress pattern! I would like the moneta I've picked the fabric too! Thanks for doing the giveaway! I think I'd go with the BHL Anna. Thank you very much for this nice giveaway! I'm choosing the Moneta dress by Colette patterns. oh oh oh! I would love to enter for the By Hand London Anna dress, please. Thanks for the giveaway! I would choose Colette's new Moneta dress. I think the Moneta Dress may just get me over my fear of sewing with knits! Thank you for wrangling a giveaway! I would love the BHL Victoria Blazer. It intimidates me, but I could SO use some me-made jackets! What an awesome giveaway. I would have to go for the Anna dress from By Hand London perfect for the summer weather. What a great giveaway! I would pick the Moneta by Colette Patterns. Great giveaway - my pick you be the Colette Patterns Albion. It's getting quite wintry around these parts (Canberra, Aus). And I am really itching to make the Afternoon Blouse! I love the Hawthorne pattern - I would start with the peplum blouse. Thank you for the giveaway.